I’ve never had a full-time job. As in, NEVER. I guess that’s what happens when you marry an “established” man before you graduate college. Elian had a great job that met our needs. I finished my degree a year after we said, “I do,” working part-time along the way. Once I graduated, our plan was to have children with whom I would stay home relatively soon. So hunting for a full-time gig was neither necessary nor wise at that point. I continued part-time work for a couple of years until I was 8.5 months pregnant with our first child. I took the last month of the pregnancy off and birthed an amazing little person in April, 2007, fully intending to stay home with her. The more we thought about it, Elian and I came to the conclusion that my paltry part-time paycheck wasn’t so dispensable after all. I mean, we could make it, but it would be jeggings tight. So we decided right after Lexi was born I would look for something part-time to give us some wiggle room. It helped both first-time grandmothers wanted nothing more than to babysit their little darling while I worked. Summer started, and I had no idea what kind of work to look for. And, frankly, I wasn’t in the frame of mind to tackle a job search. Don’t get me wrong – my heart delighted in the gift of my precious daughter. I was completely and utterly in love with her. She wasn’t much of a sleeper and thought nursing was something she should do EVERY TWO HOURS FOR THREE MONTHS STRAIGHT. And, as any woman who has nursed a child will tell you, that equates to approximately 8 minutes of sleep each day for mommy. And that is a generous estimate. Add to that the mystery “colic” she had, which really means she was inconsolable for no apparent reason, and I was moments away from being committed. Throw in a job search with the interviews and the “showering” and the whatnot, and all I could do was imagine my sarcastic response to a potential employer’s question like what are my “strengths” … I AM ALIVE AND SO IS MY CHILD. WINNING. So, you see, I wasn’t feeling the whole work thing. I just wasn’t there physically or emotionally, and every time I looked at that little baby – 4 weeks old, then 6 weeks old, then 8 weeks old – I thought the same thing: she’s too little for me to leave her for work. And yet. The financial wiggle room. It wasn’t there. The days went on, and we continued to float along, wondering what we should do. Then, mid-summerish, some friends came to visit us. At the time, they were our daughter’s appointed guardians if something were to happen to me and Elian. So they came into town to meet their possible future new addition. We visited a good long while, had some lunch, watched the baby’s every fascinating move. Then they handed us an envelope. Obviously, I knew what it was – a congratulations-on-the-new-baby card. But it felt different in my hands. It probably has a folded, hand-written note in it, I thought. I pulled the card out and read the front. I don’t recall what it said, but I remember what happened next. As I opened the card, $20 bills came falling out. More bills than I could count. My eyes filled with tears as the realization set in that many hundreds of dollars were sitting in front of me. The Lord… through His people… I’m telling you… He provides. I did stay home, worry-free, for several more months. As is the case with most colicky babies, once she turned three months old, all was right in the world. No more countless hours of crying. She slowed her roll and learned how to give me 3-4 hours between feedings, which meant my 8 minutes of sleep/day DOUBLED. I started to feel more human again. A part-time job fell in my lap. And I didn’t kill anyone. Halfway through the semester, I told my parents I was still certain I wanted to transfer. My church in Memphis was affiliated with a small school, Crichton College, that had a Bible degree. I didn’t know much about it except that a handful of people I respected were either going there or had graduated from there. And that was enough of an incentive for me to want to check it out. But my parents weren’t very excited about the idea. They didn’t want me to transfer to another small, liberal arts school, only to decide I didn’t like it, as was the case with Lambuth. They told me to pick a large state school, and be done with it. I wasn’t thrilled, but because I was going to be living with my parents and still somewhat on their dime, I enrolled at the University of Memphis for my sophomore year. My second college worked out better than my first. For starters, my friend and I helped start a branch of Campus Crusade for Christ, so I got to be involved with some strong Christians right from the start. Secondly, I was back at my home church and fully involved in the college group there. It did my soul good to be in rich Christian fellowship again. Academically, however, I was struggling at U of M. They didn’t have a Bible degree. They didn’t even have a Religious Studies degree. So, in the name of getting a “useful” degree, I started on a business track. And I hated it. I was taking a bunch of brainless gen eds, of course, and the business courses were painfully boring. I had zero interest in the corporate world. By the end of sophomore year, I knew I had to make a change. My sanity depended on it. I started looking into Crichton College again, even though my parents were staunchly against a second transfer. I had a full scholarship at U of M, but if I were to transfer to Crichton, I’d have to foot the hefty bill myself. I wasn’t sure how I’d be able to do that, but I was desperate. I applied to Crichton late in the summer of 2003. It was a long shot given my applying so late in the game. Admissions informed me the only way to get more than half of my tuition paid for was to participate in the honors program. Extra classes, extra work, extra community service. One week before classes started, the dean of the honors program called me for an interview. As I entered his office, I noticed his college diploma on the wall. Lambuth University. Aye. I took a deep breath, sat down, and told him my story. He listened. And God worked. I left with a full scholarship. The first week of school the admissions counselor I had been working with called me into her office. When I got there, she began to tell me about her weekend. “I was at church on Sunday, and every year before school starts, our small group prays for those of us who work in education. I shared your story with my group, leaving out your name, of course, and, afterward, a Fed Ex pilot asked me, ‘Does this girl have enough money for books?’ I told him I wasn’t sure, and he told me to give you this.” The counselor handed me an envelope. I opened it to find $200 in cash. Who carries that kind of cash to church? Who gives that kind of cash to a complete stranger? What kind of God prompts His follower to do such an outrageous thing? The kind of God of whom it is said, “My God will meet all your needs according to his glorious riches in Christ Jesus” (Philippians 4:19). The two and a half years I spent at Crichton College were unquestionably the most formative years of my walk with the Lord. While I grew immensely in my knowledge of Him, I grew even more in my experience of Him. I wasn’t just surviving, trying to earn a degree that would benefit me in the future. Every day had purpose, drawing me closer to Him. I used my human intellect – not the power of prayer or the resources of godly people around me – to choose a college. My lack of ability on the soccer field narrowed down the choices some. I was not going to play at a high level; I needed a small school that didn’t require tryouts. Turns out there are a lot of schools that fit that bill. But when I added the second parameter – must have Bible degree available – the list got much shorter. Unfortunately, as a new believer, I was unable to discern a good Bible program from a bad one. I didn’t know what questions to ask or what standards to have. I ended up choosing a little private school, Lambuth University, that was only an hour and half away from Memphis. They paid half of my tuition and let me join the soccer team. They were affiliated with a mainstream denomination, and they had a degree called “Religious Studies”. This all sounded great to me. I knew something was wrong my first week on campus. Athletes moved in a week before the rest of the student body for summer workouts. The talk on the field and around the cafeteria tables all centered on partying and sleeping around. I kept quiet, confused as to why people who were not concerned with living for Christ would attend a Christian school on purpose… I decided they were probably there for one of the reasons I was – they weren’t good enough athletes to play elsewhere. I held out hope that the rest of the student body – the kids who weren’t forced to pick a small, Christian school just so they could play sports – would be different. They weren’t. Campus ministries were poorly attended. The chapel was bare. And very few people seemed to have a heartbeat for Christ. I attended my Bible classes with great anticipation, eager to learn more about this book that was transforming me. While my professors taught us what the Bible said, they also asserted they didn’t believe what was written in it. They presented it as fiction or opinion, but never as truth. Daily I’d leave those classes appalled at what I was hearing. Universalism. Mythicism. Heresy. The evil – and that isn’t too strong of a word – was thick in the air. (Whenever anyone preaches a false doctrine and tries to pass it off as biblical, that is evil.) I did my best to seek out other believers, but I failed. I won’t say there weren’t any, but I never found any to connect with. And knowing that I had a great church back home and a college group I would love being a part of didn’t help. I wanted out. I needed out. I think the first time I spoke of transferring was in September. But the soccer team needed me (in the loosest sense of the word – they only had 3 subs). So I set my heart on transferring in December. I talked to my parents about it, as they were paying the other half of my tuition. I’m still not sure exactly why, but my dad wanted me to stay at Lambuth. He wanted me to pick one school and stick with it. Even though it was costing him $8k/yr. Maybe part of the problem was I didn’t really know where else I wanted to go. I just knew I didn’t want to stay at Lambuth. My parents told me to at least finish my freshman year before making any decisions to transfer. Maybe they thought I was just a little homesick and needed more time to get comfortable. But that second semester was no better. I knew when I went home for the summer that I’d never go back. It’s been a decade since that year of my life, and I still look back on it as a dark time. A lot of days (and nights) it was just me and my Bible, trying to make sense of why God had led me to “the desert”. I might not ever know for sure, but having no friends, no car, no money, and no local church, at the very least, I learned to do life with “just” God. I read the Bible every day and grew in my knowledge of it. When my professors taught a theology that didn’t sound right, I learned how to figure out why it wasn’t right biblically. My freshman year was a time of intense growth, albeit painful growth. And maybe that was part of the lesson God was trying to teach me – growth isn’t always fun or easy, but, take heart, for I am with you. As a former skeptic, when I became a believer in high school, I was insanely focused on knowing why I believed what I believed. For my own sense of security, I needed to discover the facts behind the doctrine I was being taught at church. So I dove into the Bible. I read. And I had questions. Lots of questions. God knew that would be the case, so He strategically placed some knowledgeable people in my life to help me understand what the Bible was saying and why it was saying it. Remember that youth pastor, Darryl, that showed up the same day I did at Central Church? We hit it off, and he discipled me my first year at Central. That means he took the time to teach me about God one on one. Because I was a senior in high school, that was the only year I got with Darryl. And, you know by now, I don’t consider our paths crossing a coincidence. My time learning from Darryl was crucial to solidifying my faith. A lot of people make decisions to believe in Christ, but they fall by the wayside, never fully developing an understanding of the Bible or Christianity because no one is there to take them under their wing and teach them. But the Lord was gracious to me and placed two such people in my life that year. The other guy, Stephen, was the intern for our youth group. He had a ton of Bible knowledge in part because his dad, a pastor, is a walking Bible. But Stephen was also a college student studying Biblical Studies and Theology at the time, so he was game for any question I could throw at him. We exchanged many book-long emails discussing the finer points of free will, predestination, and the meanings of words in the original Hebrew and Greek manuscripts. I learned a lot. 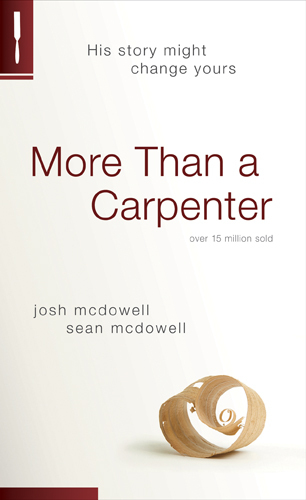 Perhaps the most important thing I learned was, as Josh McDowell says, “Never has an individual been called upon to commit intellectual suicide in trusting Christ as Savior and Lord” (More Than a Carpenter). If my junior year of high school was the year I discovered Jesus, my senior year was the year I discovered my passion for the Bible. And that passion would infiltrate the rest of my life.